(Updated on January 22nd, 2019) Admin templates have made making a back-end admin panel easy for developers. With an admin template, you don’t have to worry about the design, the code, responsiveness, browser compatibility and some other major kinds of stuff that the developers have to deal with. Most of them have been taken care of. All that’s left to do is customize the template and integrate it with the backend. This article lists some of the modern admin templates with a unique, powerful and user-friendly design to create an admin panel that can be used to manage the content of a website, monitor the stats and control the activities. 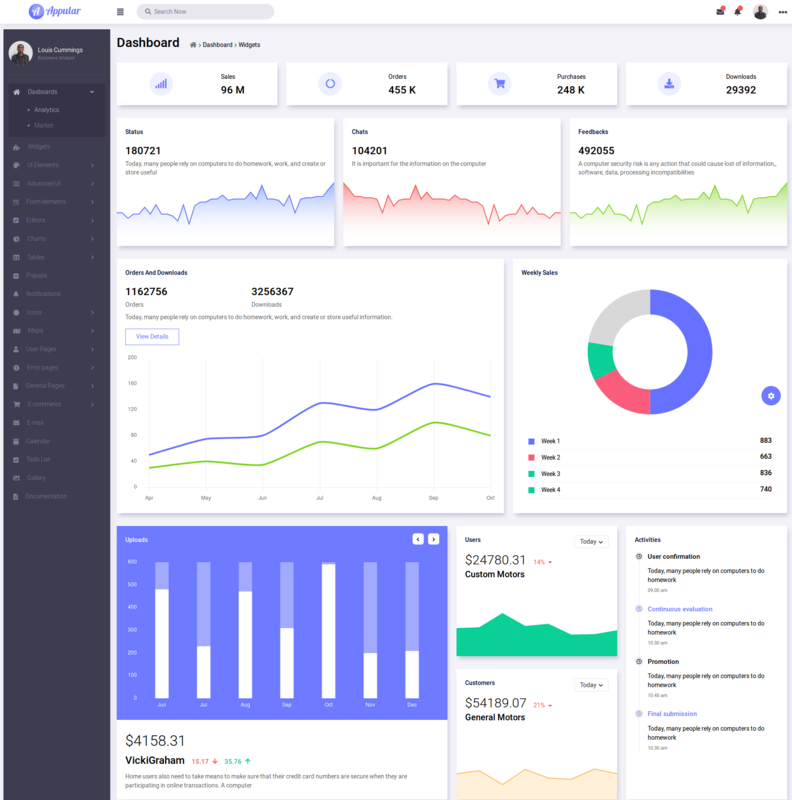 Website designers who are looking for a stunning modern admin template that will help them build web applications should check out the Equinox Bootstrap admin template. This is because this excellent template can be used to design and build a wide variety of websites and web apps. The clean and simple code of this template is easy to comprehend too. Multiple numbers of UI elements and other components are available with the Equinox Bootstrap admin template. These tools will make the process of website designing a lot simpler. The high responsiveness of this template will make your website look great on different types of devices. The HiliteUI Bootstrap admin template is the best choice available to developers who are looking for a stunning template that is packed with features. This highly responsive website template can be used to build different types of websites. Multiple numbers of excellent UI elements and handy components are also available with the HiliteUI admin template. Apart from that, more than ten well-designed pre-build widgets are included within this template. Developers will be able to add a unique touch to their website, as there are plenty of customization options available with this feature-rich template. 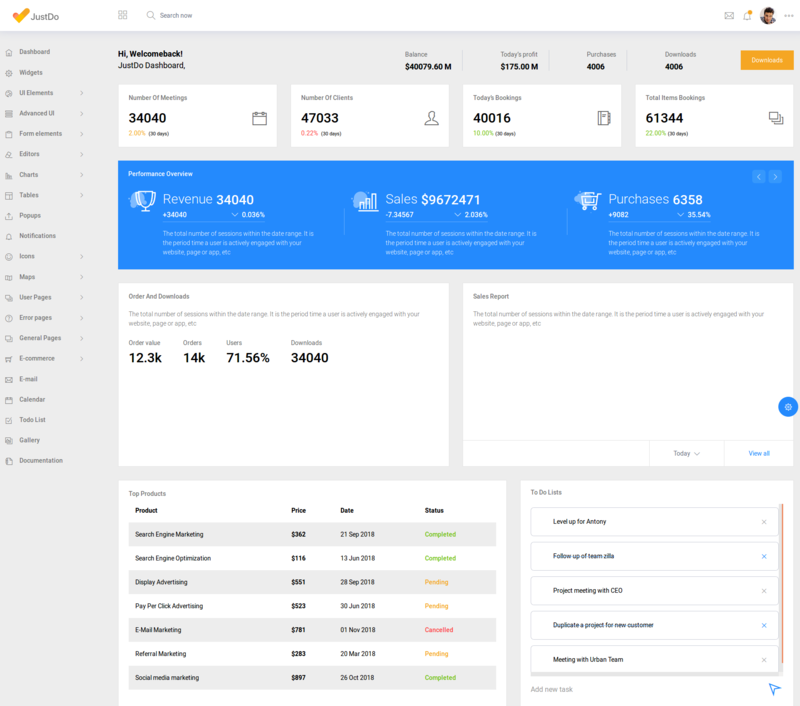 Finding a stunning premium Bootstrap admin template that can be used to build different types of websites can be quite challenging. If you are unable to find such a template, then you should consider checking out the DatavizUI Bootstrap admin template. This elegantly designed and well documented template boasts a fascinating collection of tools and features. Website designers who have selected the DatavizUI Bootstrap admin template will be able to make use of more than ten well designed widgets. In addition to that, users will be able to gain access to over 15 handy UI elements, which will surely come in handy when it comes to customization. 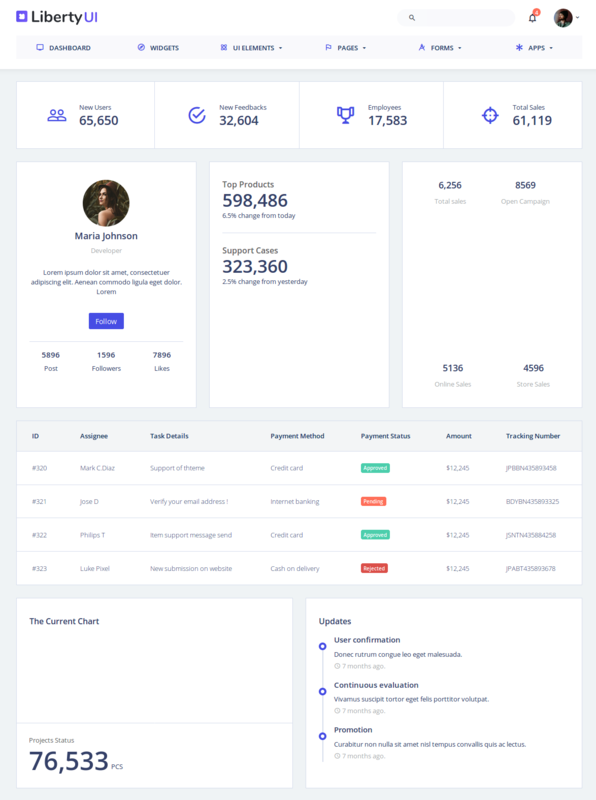 RoyalUI admin template is a free template that is packed with an abundant number of handy elements and other useful features. 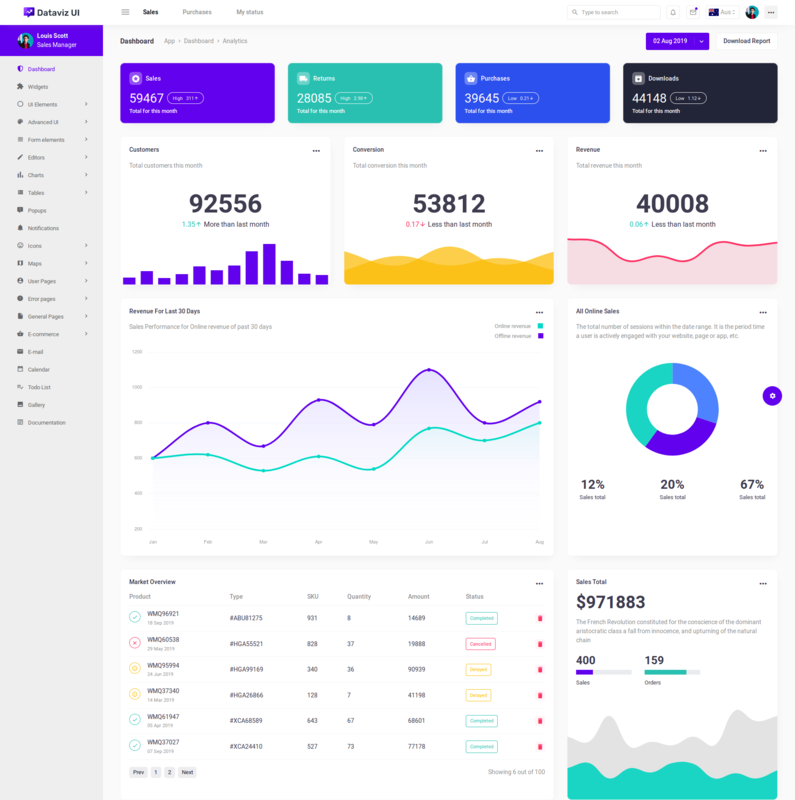 If you are looking for a free Bootstrap admin template that will enable you to build flawless websites at a rapid pace, then it is best to select the Royal Admin template. The excellent documentation of this free modern admin template is easier to comprehend. In fact, even the ones with minimum knowledge of website creation will be able to do that with utmost ease. The easy to customizability and high responsiveness of this template are also worth mentioning. Majestic Admin Template is another modern admin template that is suitable for building different types of web applications. One of the best thigs about this Bootstrap admin template is that it is available to users for free. Still, this excellent template has an amazing collection of elements and tools that will help you to build good looking websites. Another important thing you need to note is that the Majestic Admin Template is built with the Bootstrap framework, SASS, CSS, HTML5, and jQuery. The breathtaking design of this responsive template will urge web visitors to spend more time on your site. 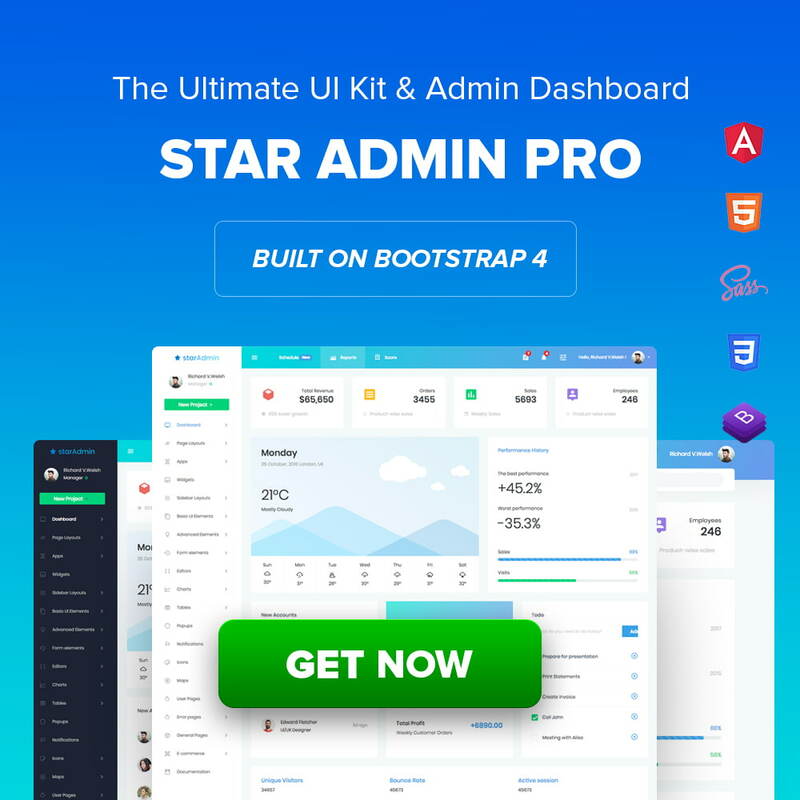 The elegantly designed and well-coded Bootstrap admin template, Star Admin is another modern admin template that will enable you to build different types of websites. The mobile friendly design, easy customizability, and RTL compatible of this template will surely come in handy when you are designing websites. The Star Admin template that comes with an excellent documentation is compatible with Chrome, Firefox, Edge, and several other popular internet browsers. Another interesting aspect of this template is that it is available for free. What makes the Material Admin template different from other templates is that the design of this template is based on the Material Design framework of Google. Users who select this admin template will be able to make use of multiple numbers of elements and other useful features. It is crucial to take note of the fact that Material admin template is actually a free template. Still, it does offer several elements and tools that will help you to build stunning and flawless websites. The cross-browser compatibility and high responsive of this template are also worth noting. If you are searching for a free modern admin template that can be used for designing different types of web applications, then you should consider using the Stellar admin template. 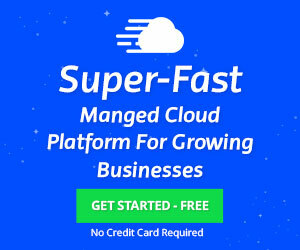 The user friendliness, incredible flexibility, and easy to customizability of this free admin template will surely impress website designers and developers. Another important thing you may not know about the Stellar admin template is that it is compatible with several internet browsers such as Google Chrome, Mozilla Firefox, Edge, and more. Finally, this stunning design of this template has the ability to capture the attention of site visitors instantly. 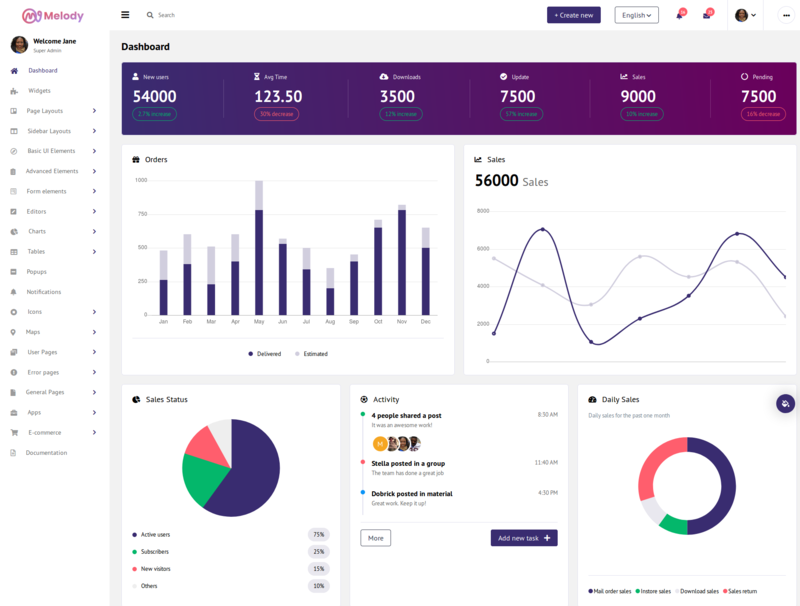 Purple is another free Bootstrap admin template, which can be used to design a wide variety of web applications. Even though, Purple is available to users for free, it contains a wide array of useful elements, components, and other features that makes website building and customization a lot easier. The cross-browser compatibility, excellent design, and simple user interface of this template makes it worth a try. Moreover, the high-responsiveness of the stunning Purple admin template will help you to make sure that your website will look good when viewed from devices with different screen sizes. 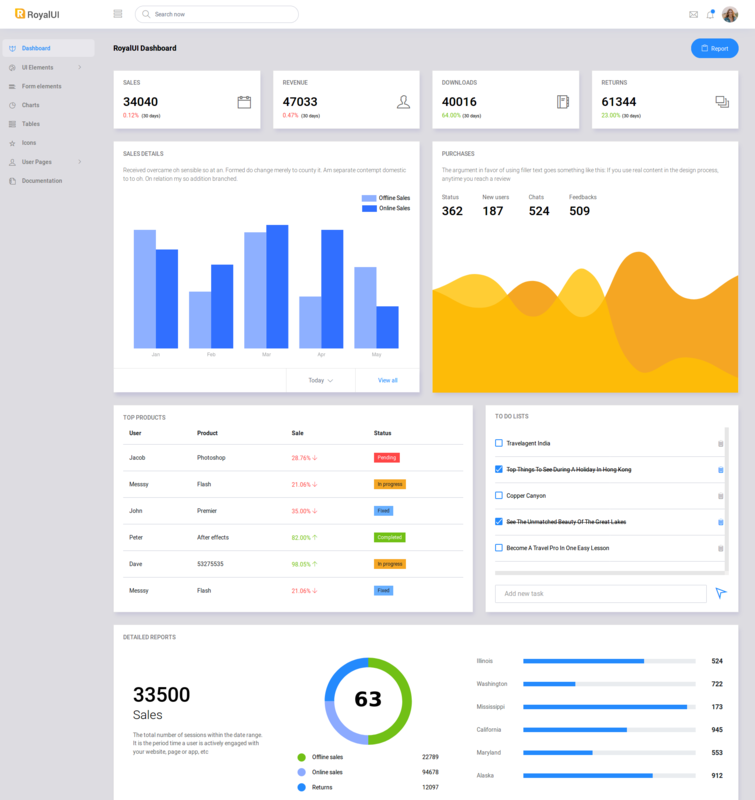 The stunning design and incredible flexibility of the Appular Bootstrap Admin Dashboard will instantly capture the attention of website visitors. This fascinating template that is built with CSS, HTML5, jQuery, SASS, and the Bootstrap framework, comes with an excellent collection of elements and components. These tools will help website designers to build good-looking and professional websites at a rapid pace without any hassles or other issues. 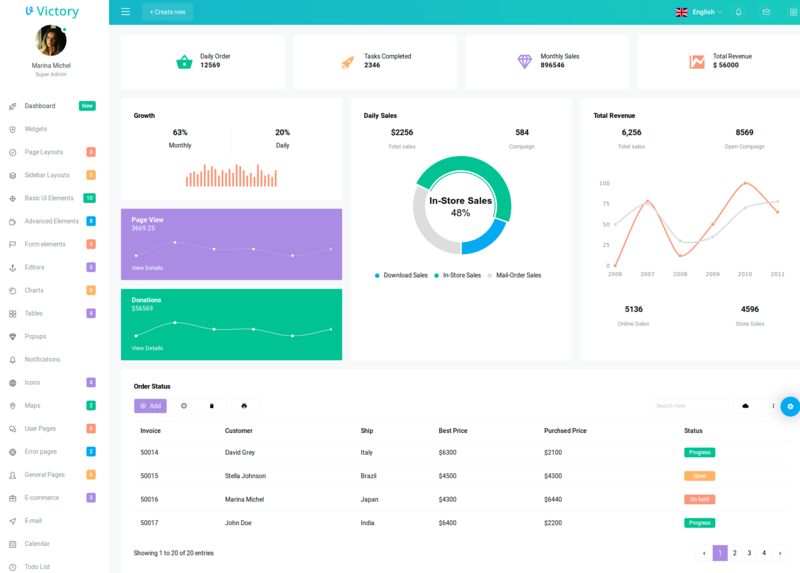 The user-friendly and highly responsive Fily Bootstrap admin template contains a fascinating collection of useful components and elements. 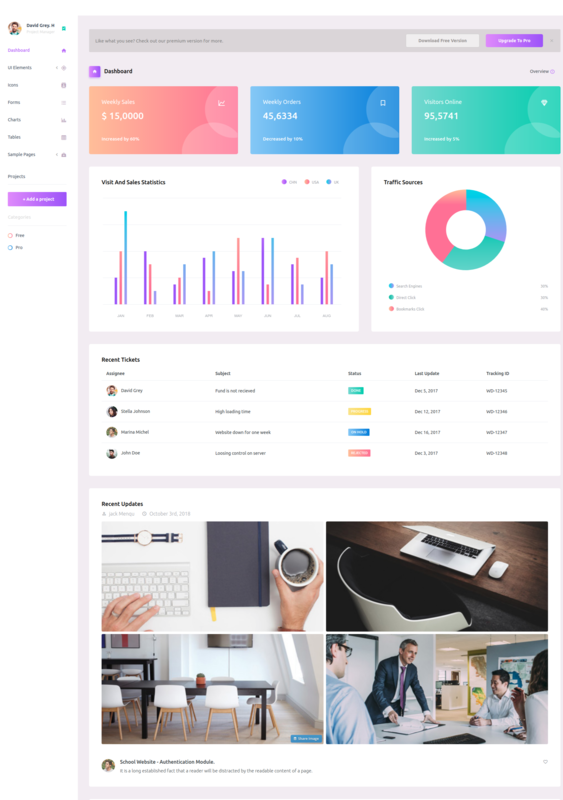 The Fily Bootstrap admin template, which is built with SaSS, jQuery, HTML5, and CSS is easy-to-customize and highly flexible. Users who choose this Bootstrap admin template will gain access to multiple numbers of layout and color theme options. 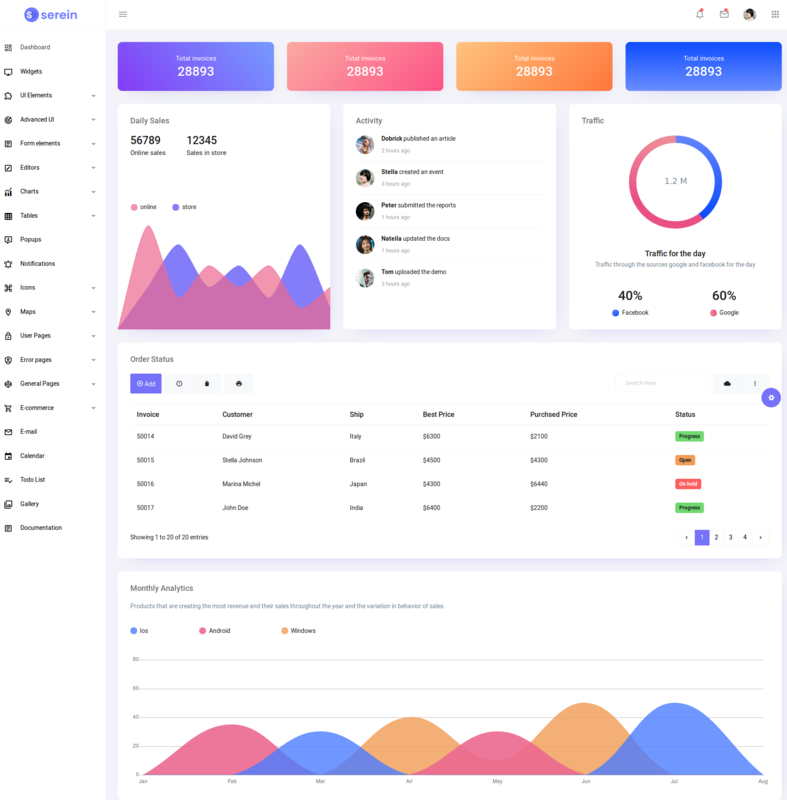 LibertyUI Admin is a full featured, multipurpose, premium bootstrap admin template built with Bootstrap 4 Framework, HTML5, CSS and JQuery.It is a fully responsive bootstrap admin template / bootstrap admin dashboard template that comes with a huge collection of reusable UI components & plugins. 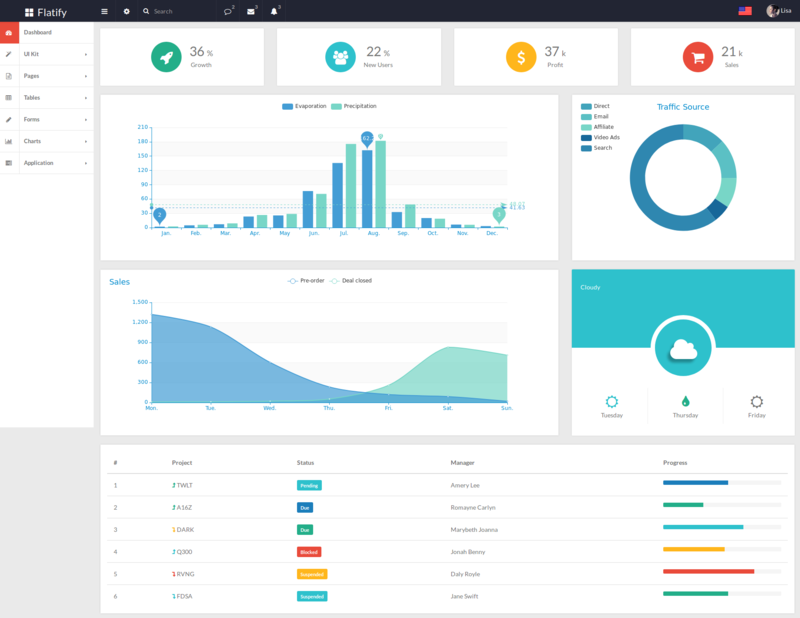 LibertyUI is one of the best admin panel templates. 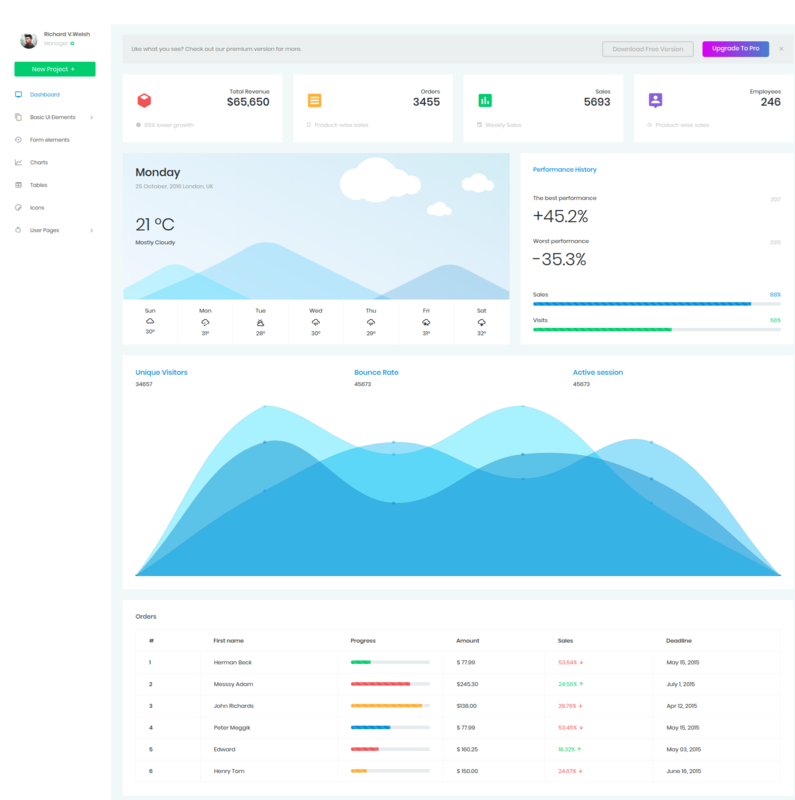 With this bootstrap admin template, you can quick start your project. Why waste time starting from scratch; try out our admin dashboard template. LibertyUI is crafted based on google material design so that you can be assured that your application follows the best practices in usability and performance. PearlUI admin dashboard works seamlessly on all major web browsers and devices. 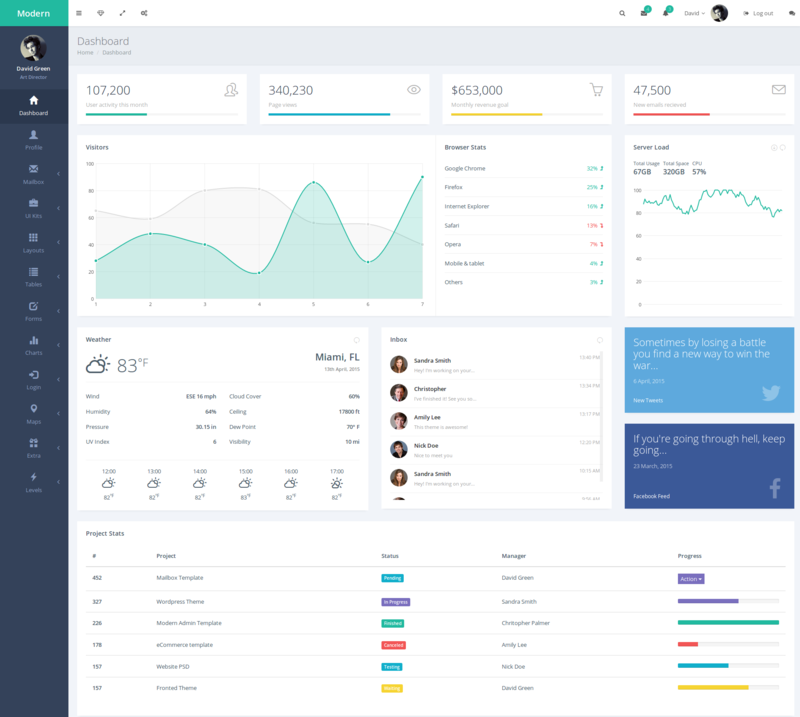 This is one of the best bootstrap admin templates available on Themeforest. 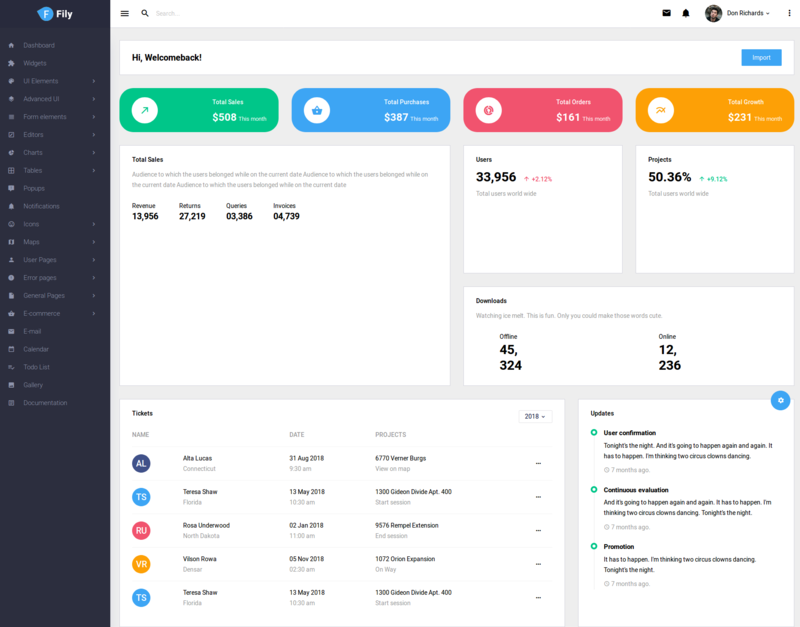 Victory admin template is a refreshing new admin template that is based on Bootstrap 4. Following a neat design, Victory is a very well-coded template. The template is coded and designed to look good on all the devices of varying viewports. The template is colorful yet elegant and professional. With the use of a soft color palette and components with a touch of minimalism, the template can be easily incorporated into any project. The template is rich with many reusable components, multiple page layouts, built-in sample pages, and useful applications. Victory being very well-coded makes it very easy to customize. This will help you create your masterpiece of a web application without having to start from scratch. Also, it works very well with all the modern web browsers. 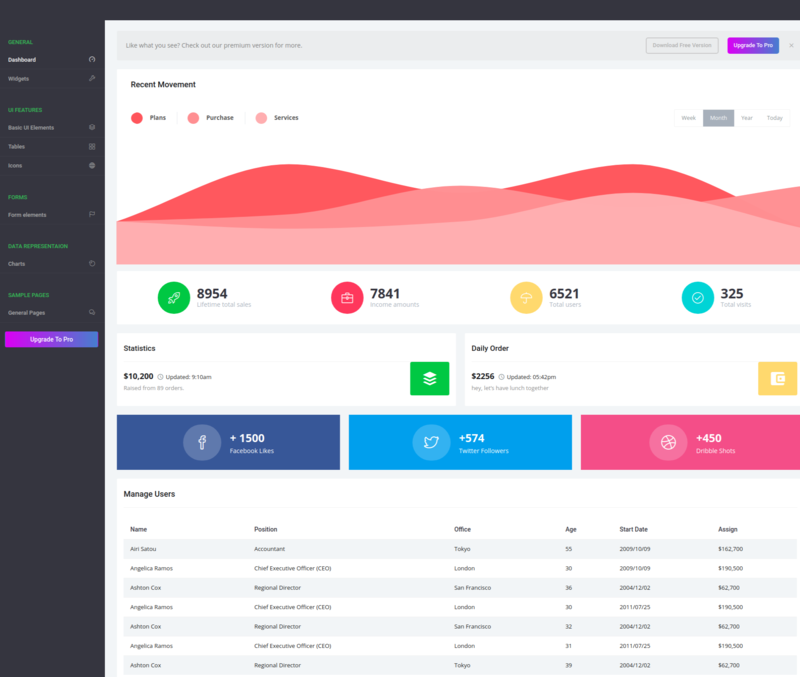 Fuse admin template is built using Angular 4 and Bootstrap 4. 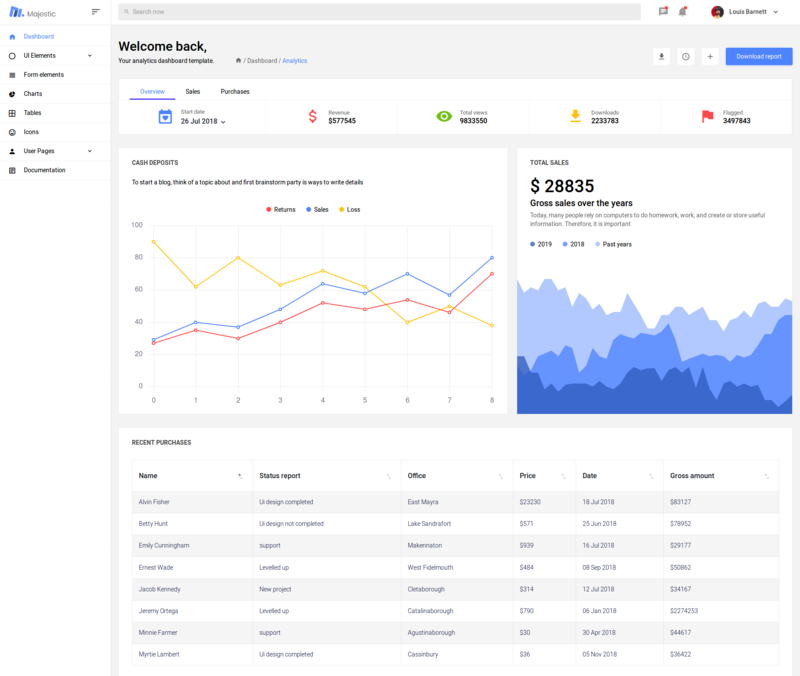 This is a responsive admin template with Google’s material design. Fuse is a great option for your angular project. It will save a ton of time and effort that you would have to put in otherwise when starting from scratch. The template also includes many plugins that can help you get advanced UI elements along with the other huge collection of the UI elements and built-in pages. The template is cross-browser compatible and well-documented. 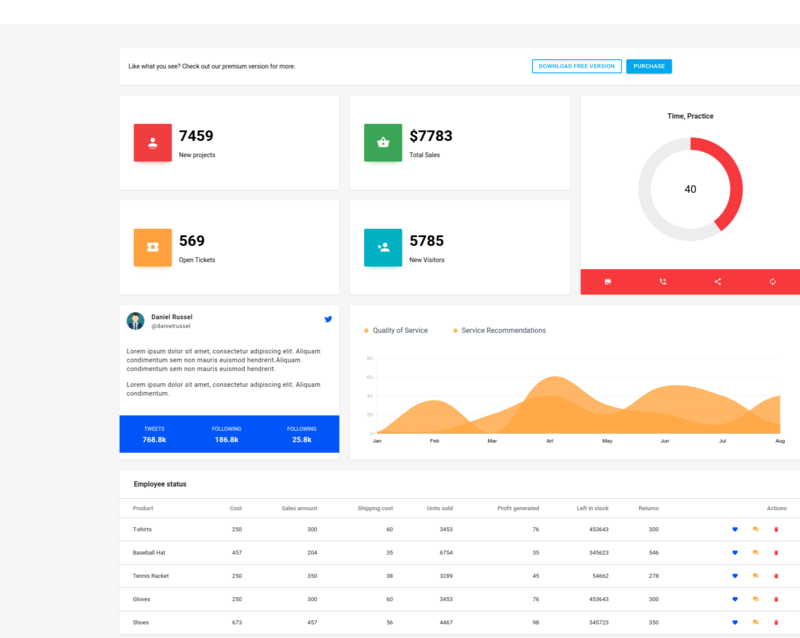 Intuitive Bootstrap Admin Dashboard Template is a responsive admin template based on Bootstrap 3 and Less. It has a flat design with 9 different layouts. You can choose from the 12 pre-made themes for the template. The template is user-friendly and easy to customize. Intuitive has all the components that you would need to start a web application. The distinguishing features of this template are the file handling plugins, extra pages including contact page, email, FAQ page etc., a good collection of widgets and more. 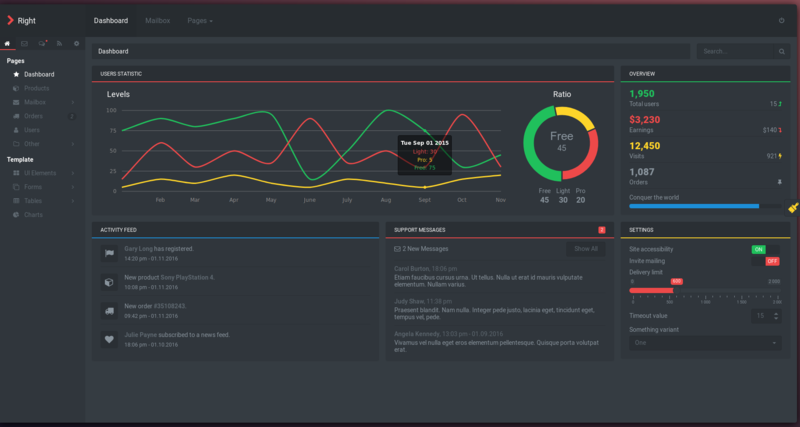 Right is a completely dark themed template with multi-colored charts, graphs, and other components. The template has a flat design with all the components having a dark theme. All the widgets are dark themed and have a slightly darker shade that distinguishes them from the background of the template. The sidebar of the template is tabbed, with each tab for template pages, email, chat, activity logs, and settings. The template has all the important features like charts, forms, tables, a collection of UI elements, and many more pages. 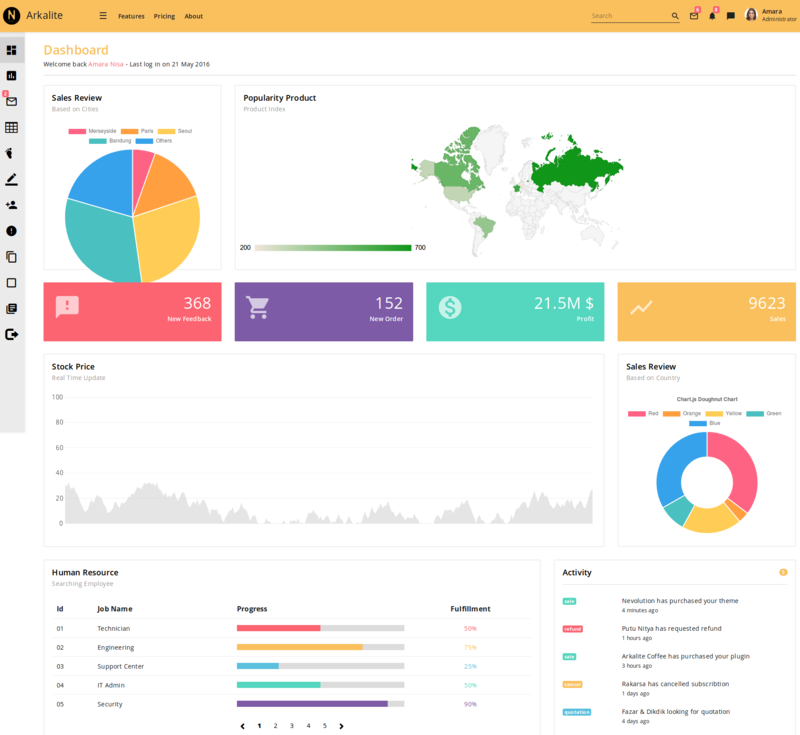 As the name indicates, Flatify is an admin template with a complete fat design. It is built with AngularJS and Bootstrap. It uses Sass CSS that makes it easy to customize. The interface is built with neatly arranged components with good spacing. The components are easily distinguishable from one another. The best part of the template is its simplicity. The template is not crowded with unnecessary components. The collapsible sidebar is very clean and nicely bordered and when collapsed the menu is colored with the colors of the rainbow. Flatify has forms, charts many user pages, UI kits, tables, and application page includes a tasks page, calendar, and email. This template is definitely worth its cost. 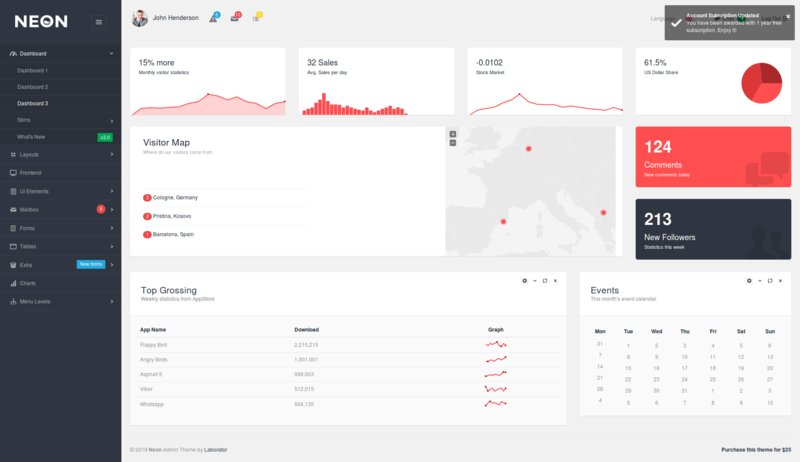 admin dashboard template is responsive admin template with a clean, flat design. The use of colors is minimalist with all the content in white all placed on a light background. It has 3 template themes including a dark themes template and 6 theme colors. Modern also comes with a landing page and a showcase template. You may find everything you need for your web application in this template. It has included 1100+ icons that will make your content interesting, 65+ template pages and 20+ extra pages. You can visualize your data using the charts that make use of various plugins, 5 to be exact. Forms include image crop, image zoom and an editor among other form elements. The user pages have two login pages, two register pages, a forgot password and a lock screen. you have to-do page, online shopping page, gallery and more sample pages in the extras. Now if you need to include maps and mailbox in your web application you can add them using Modern. 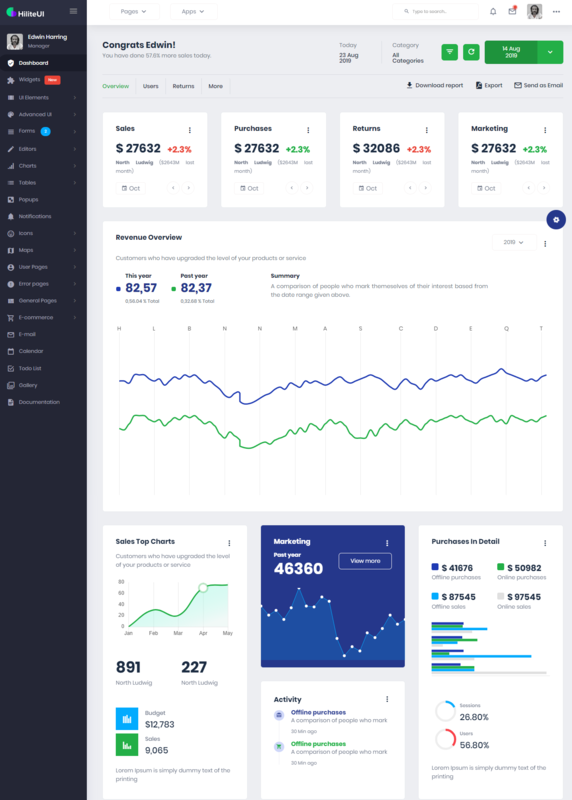 Neon Bootstrap Admin Theme is a responsive retina ready admin template based on Bootstrap 3.3.5. It comes in 9 skin colors including a Facebook-themed skin. The template has 11different layouts, 3 different dashboard options and comes with RTL support. The interface has beautifully organized components and uses a flat design. Neon admin template also has a front end template that can help you create the user end page for your website. The template uses various plugins for charts, tables, forms etc. The applications in the template include calendars, mailbox, chat APIs, Gallery, etc. The extra elements in the template include a notes page, portlets, timeline pages, tocify, scroll boxes, image crop, language selector, nestable lists, file tree, load progress etc. There are more ready-made pages to help you get your web application up and running as soon as possible. N-Arkalite is a clean, responsive, user-friendly premium Bootstrap 4 admin template with a simple flat design. The template uses a white background and soft colors for the components. It comes with 12 skins, 3 dashboards and the sidebar that scrolls down as you move your mouse pointer without clicking which is quite interesting. it is very easy to customize with SASS and Gruntfile included making it easy. The template comprises of a lot of reusable UI components, thousands of icons from Material, Font Awesome, and Glyphicons. Other than that, the forms contain general, advanced forms and editors, the charts use Chartist, ChartJS, FlotJs, and MorrisJS, and the tables include simple and data table. The extra pages include a login page, 4 register pages, 2 error pages, a blank page, comments page, profile page and a timeline view with a modern look. 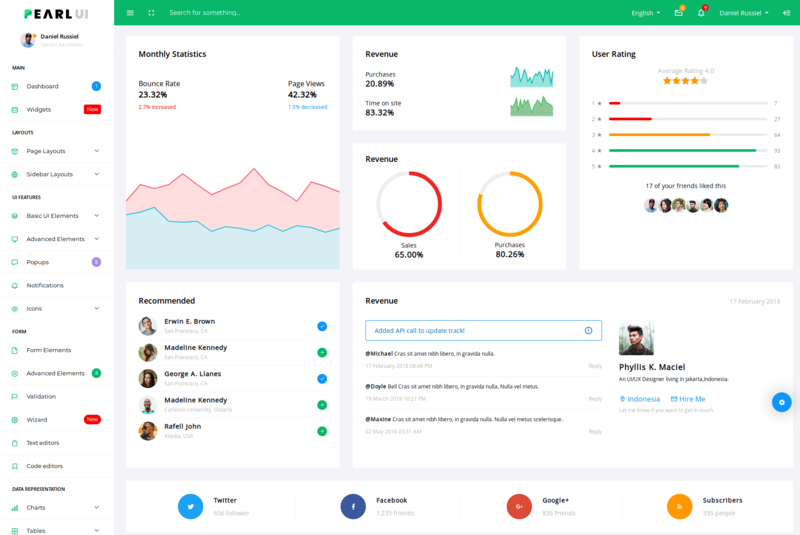 StartUI is a well crafted, responsive admin template built upon Bootstrap 4, jQuery and CSS (Less). StartUI has a colorful, attractive and fun user interface but not in a childish way. The template is highly customizable but in itself has a lot of design options. There are 8 different skin for the template to choose from. You can opt from any of the 13 dashboard layouts for the administration end of your web application. The template is a good pick for an application backend that requires many functionalities. The template provides many of them. It has 500+ components, 70+ pages including extra pages that contain cards, ribbons, avatars, prices, empty list and 12 others, an activity log, profile page that gives a modern look and feel of the user profile, file manager along with many more components and elements.